In 2010 Nissan turned heads when they launched the all-new Juke. The Juke was seen to be the first small crossover to go on sale and started an entirely new segment for supermini crossovers. Since the launch of the Juke, rival manufacturers have released their own entries into the supermini crossover market, like the Mazda CX-3, Peugeot 2008, Renault Captur and more. In 2014 Nissan launched a new facelift model Juke with increased boot capacity, upgraded Nissan technologies and new safety features. 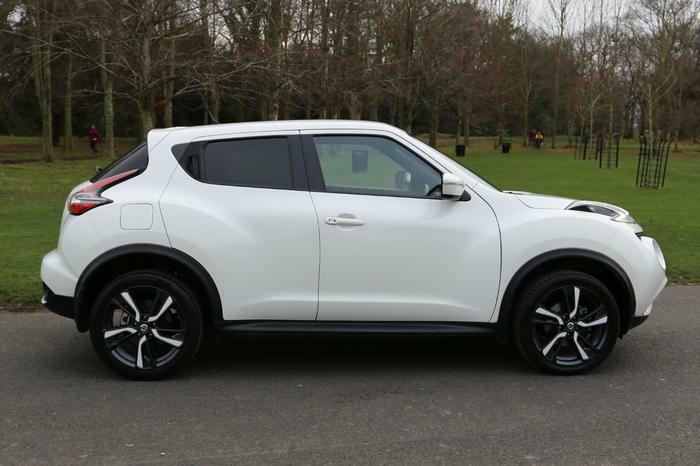 The Juke has a distinctive look that is immediately noticeable on the road. Its sculped, muscular body shape gives this supermini crossover a more powerful presence than competitors. 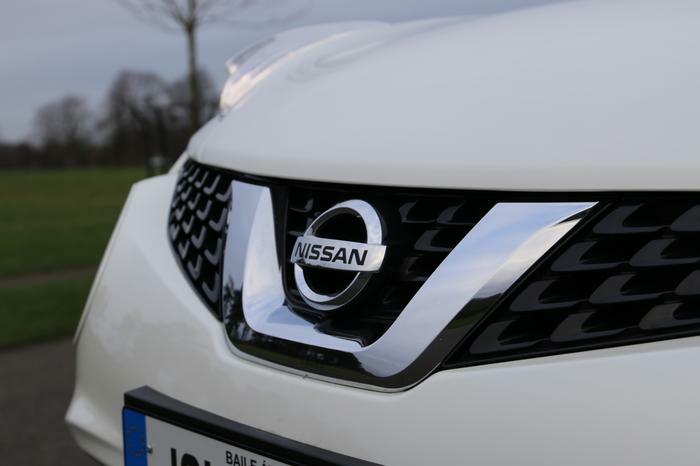 Bold boomerang-shaped headlamps and a dramatic Nissan V-shaped grille add to the rally-inspired look. Standard XE models come with 16-inch alloy wheels, whilst the SV and SV premium models come with 17-inch sport alloys that make the Juke stand out even more. 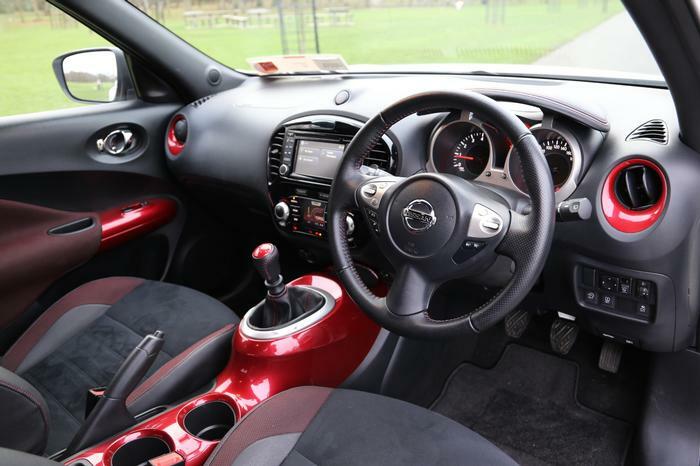 Nissan say that the interior of the Juke was inspired by famous sports motorbikes. This is most evident in the coloured circular gauges and dramatic centre console. For me this look feels very plasticky and dated compared to the latest Nissan models. The infotainment system also feels a bit dated with its rather small screen and slightly limited interface. SV and SV Premium models come with Bluetooth connectivity for phone and audio streaming as well as a multifunction leather steering wheel. In addition, the SV premium models come with a rear-view camera and start/stop button. 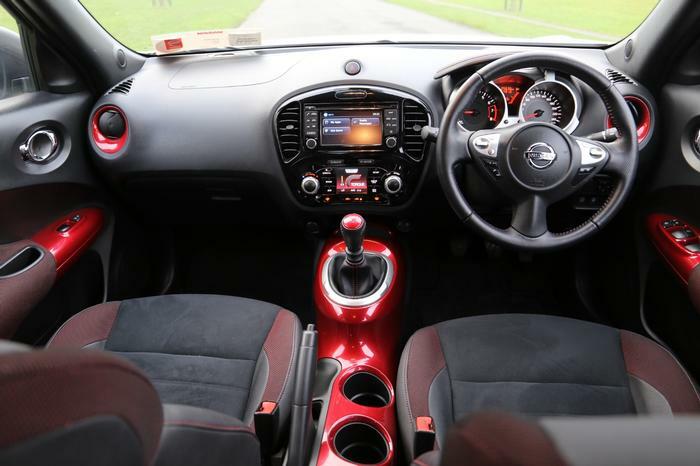 The cabin of the Juke is quite spacious and comfortable with bucket-style seats that sit you in a high driving position with a clear view of the road. 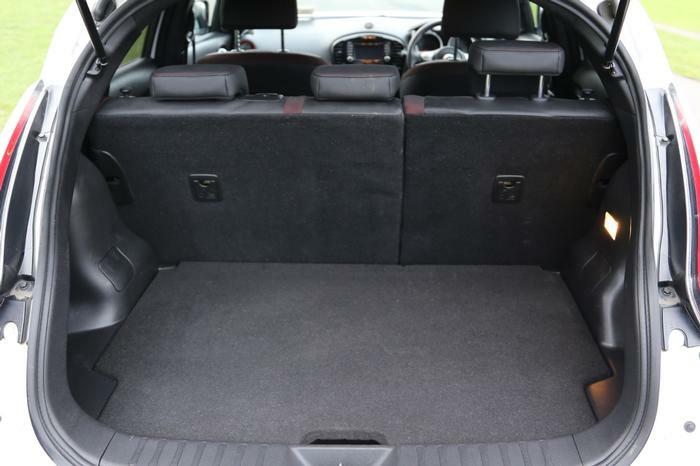 The same can't be said for the rear of the vehicle where space is very tight for passengers, which is to be expected from a supermini, but would be suitable for young children. Although the boot space was increased to 353 litres, storage is quite limited in the Juke but is fine for carrying essentials like shopping bags. If you do require more space, the rear seats can be folded down easily. On the road the Juke offers a reasonably pleasant and fun drive, although the suspension does feel slightly firm at times when driving over bumps even at low speeds. The Juke offers quick responding steering around sharp corners which really benefits when driving in cities and towns. The Dynamic Control System which also doubles up as climate control allows you to switch between driving modes and adjust engine and steering responses at the push of a button. Sport Mode sharpens steering feel, transmission gearing and throttle response. Eco Mode allows you to get the most out of every drop of fuel. 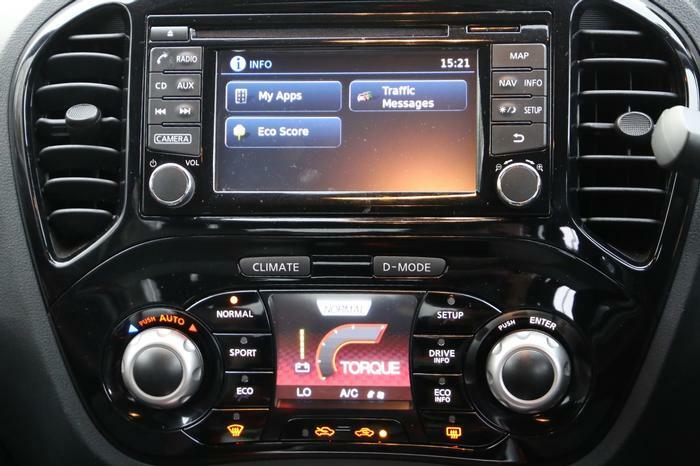 The system also allows you to track your fuel consumption encouraging you to get maximum economy from your Juke. The Juke is available in three different specifications, Juke XE from €19,995, Juke SV from €21,445 and Juke SV Premium from €22,545. The standard XE model is available with a 1.6 petrol engine and 5-speed manual transmission. SV and SV Premium models are available with 1.2-litre petrol and 1.5-litre diesel engines with a 6-speed manual gearbox as well as a 1.6-litre petrol engine with automatic transmission. The test car we drove is a 1.2 petrol SV Premium which is priced at just €22,545. With this you get an engine start/stop button, rear view camera and interior personalisation pack for just €1k more than the SV model. The Nissan Juke is a fun car to drive with a quirky design inside and out. 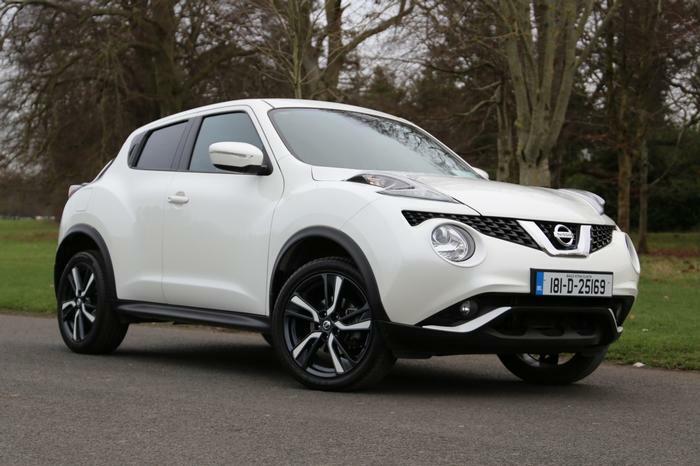 A popular car on Irish roads the Juke certainly stands out from other supermini crossover alternatives. Although it isn’t a particularly practical car, with tight space for passengers in the rear and limited boot storage, the Juke is comfortable for the driver and delivers a sporty performance for city driving.